Tubes, Pipe & Box Section. Steel road plates and large area steel plates. Universal Beams, RSJ, Lintels & Rolled Hollow Sections. Portals, portal frames and portal frame buildings. Plain and coloured galvanised roof sheets and ridges. Railway sleepers, reclaimed architectural salvage gates and fencing. 12.200 Mtr 305 mm x 102 mm x 25 Kg/m Steel Beam / ub Universal Beam / Rsj / Girder. We can source most sizes of steel should your project require steels not displayed in our shop , please call for further details if this is the case. Unused steel universal beam 12.200mtr long 305mm x 102mm x 25kg/m universal beam Stored outside so may be stock rusty Please note this will need 1 no cut for us to transport, cut to a maximum length of 8 metres. Universal Beam / Rsj / Girder. Some of our latest items in Steel Beam... 1 Mtrs 254 X 146 X 31 Universal Steel Beam Rsj. 1.5 Mtrs 254 X 146 X 31 Universal Steel Beam Rsj. 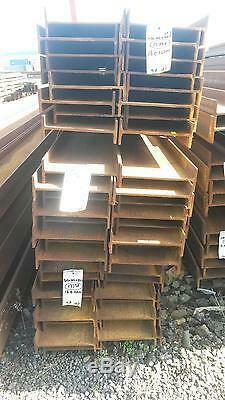 2 Mtrs 254 X 146 X 31 Universal Steel Beam Rsj. 2.5 Mtrs 254 X 146 X 31 Universal Steel Beam Rsj. 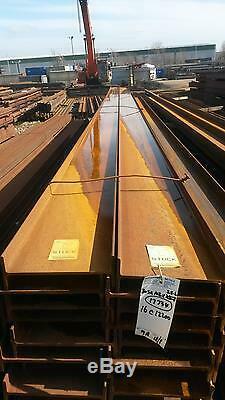 3 Mtrs 254 X 146 X 31 Universal Steel Beam Rsj. 3.5 Mtrs 254 X 146 X 31 Universal Steel Beam Rsj. 4 Mtrs 254 X 146 X 31 Universal Steel Beam Rsj. 4.5 Mtrs 254 X 146 X 31 Universal Steel Beam Rsj. 5 Mtrs 254 X 146 X 31 Universal Steel Beam Rsj. 5.5 Mtrs 254 X 146 X 31 Universal Steel Beam Rsj. 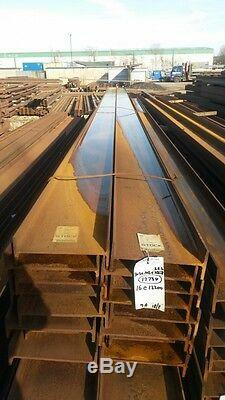 6 Mtrs 254 X 146 X 31 Universal Steel Beam Rsj. 6.5 Mtrs 254 X 146 X 31 Universal Steel Beam Rsj. 7 Mtrs 254 X 146 X 31 Universal Steel Beam Rsj. 7.5 Mtrs 254 X 146 X 31 Universal Steel Beam Rsj. 8 Mtrs 254 X 146 X 31 Universal Steel Beam Rsj. 8.5 Mtrs 254 X 146 X 31 Universal Steel Beam Rsj. 9 Mtrs 254 X 146 X 31 Universal Steel Beam Rsj. 9.5 Mtrs 254 X 146 X 31 Universal Steel Beam Rsj. 1 Mtrs 254 X 102 X 28 Universal Steel Beam Rsj. 1.5 Mtrs 254 X 102 X 28 Universal Steel Beam Rsj. Prices include vat and a full vat invoice will be produced on despatch of goods. Our standard deliveries are carried out weekly, using a large articulated lorry without off loading facilities. You will need to provide unloading facilities especially for large or heavy items. We pride ourselves on giving our customers a very good service. We stock 1000s of items and sell both online and to visitors to our premises. If you can't find what you're looking for please view our shop or use the "ask a question" link at the bottom of this page. Photos showing an illustration are intended as guide to shape and size, rather than actual condition. The item "12.200 Mtr 305 mm x 102 mm x 25 Kg/m Steel Beam / ub Universal Beam / Rsj /" is in sale since Thursday, October 13, 2016. This item is in the category "Business, Office & Industrial\Building Materials & Supplies\Other Building Materials". The seller is "ainscoughmetals-01942-615850" and is located in Skelmersdale, Lancashire,WN8 8DZ. This item can be shipped to United Kingdom.